We are SeaDream Yacht Club Experts! What Makes SeaDream Yacht Club Special? SeaDream Yacht Club is a family owned, boutique yacht company which provides a yachting experience. Yachting on SeaDream is different from big ship cruising; On each of their mega yachts, only a maximum of 112 guests are pampered by an award-winning crew of 95. Your ultimate pleasure is SeaDream’s passion. It is this attention to detail and unstructured elegance that guests return to again and again, becoming Club Members of this very special yachting family. With a draft of only 14.3 feet, SeaDream I and II visit the yachting playgrounds and harbors where larger cruise ships can not go. From May through October, SeaDream I and II sail on 7 night itineraries to classical yachting ports in the French and Italian Riviera, Costa del Sol, the Amalfi Coast, the Greek Islands and the Adriatic and Black Seas, including the classical yachting ports of Nice, Monte Carlo, Cannes, St. Tropez, Santorini, Barcelona and Portofino. 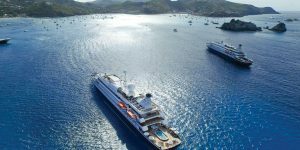 From November through April, SeaDream I and II offer 5, 7 and 9 night itineraries in the intimate yachting harbors in the Caribbean – St. John, St. Croix, St. Martin, Virgin Gorda, St. Barts, Jost van Dyke, Barbados, the Grenadines, Saba, Nevis and more. Trans-Atlantic voyages feature special speakers focusing on wellness, health, world affairs, current news and aviation. For guests that can stay a bit longer, the itineraries are designed to be taken back to back without repeating a port of call, for a unique 14-night yachting experience. SeaDream offers an additional 10% savings on the second 7-night voyage when both are booked back-to-back. Yachting Attire – The SeaDream yachting experience personifies “Casual Perfection”. Onboard, resort casual sportswear is all that is needed with comfortable footwear for shore-side visits and casually elegant resort wear for your evenings aboard. SeaDream’s Spa – A rejuvenating experience awaits you at the Spa. The SeaDream Spa provides the ultimate in time honored and luxurious Thai therapies. The Spa uses the exclusive Aromatherapy Face and Body line by DECLEOR, Paris® in all of our treatments. The SeaDream Spa is Thai certified and the only one of its kind at sea. You may enjoy some of our treatments cooled by the sea breezes in our open air private massage area. Tai Chi and yoga are also available on deck as requested by guests. There is also a hair and nail salon. The Fitness Center – Located on Deck 4 forward, features wide ocean views, treadmills, elliptical machines, recumbent bikes, and free weights all with flat screen TVs and DVD players. Medical Facility – Both SeaDream yachts have a well-equipped medical facility aboard and a licensed, highly trained physician on all of our voyages. The Golf Simulator – On SeaDream, guests are able to select from 30 championship courses on our state-of-the-art Golf Simulator. Our Activities Directors can also assist guests in arranging tee times at golf courses in our ports-of-call. SeaDream’s Champagne & Splash™ – A true celebration of the yachting lifestyle. The guests and crew celebrate with flowing champagne toasts and caviar served shore side followed by a delectable beach barbecue, elegantly served on china. On voyages where it is not possible to host our Champagne and Caviar Splash ashore, we celebrate on-board on the Pool Deck along with specially prepared surprise treats from the Chef. This is a signature SeaDream event that the crew looks forward to and each guest will remember. The Top Of The Yacht Bar – This specially designed Bar is on Deck 6. It is a great place to gather and take advantage of the 360 degree views and breezes. This is just the place to enjoy an after dinner (or any time for that matter) cigar from SeaDream’s humidors and libation. Balinese Dream Beds – Each of our yachts feature the sensational Balinese Dream Beds. These, highly popular, double sun beds are on Deck 6 aft by the Top of the Yacht Bar. The Dream Beds are raised above the sightline of the yacht’s railings to provide unobstructed views. Large umbrellas are available to provide shade when desired. The perfect place to sunbathe, read a book, gaze out to sea, enjoy the breezes or take a well deserved nap. We also offer turndown service with feather pillows and cozy duvets should a guest choose to sleep under the stars. The Library – An elegantly designed, wood paneled library offers a large selection of books ranging from the classics to bestsellers. Magazines, newspapers, board games and computers with internet connections are also available 24 hours a day. Make your selection and curl up in the cozy atmosphere for a while. The Casino – You may not be James Bond but you can certainly practice your moves at the Black Jack tables. Enjoy an after dinner drink from the Piano Bar located just steps from the Casino. Much like Mr. Bond, you may feel like you are yachting with lady luck. Piano Bar – A relaxed lounge area where one can enjoy an after dinner cocktail and make a special request from the piano player. Starlit Movies™ – We have taken dinner and a movie a luxurious step further. On clear nights you can retire to the pool deck after dinner to enjoy a concert or movie with a starry sky and your port of call as your backdrop. Popcorn and a drink of choice are available at your request. On evenings when the weather is not perfect, you can enjoy the event in the Main Salon. Main Salon – The Main Salon is large enough to accommodate all guests at one time. It is elegantly appointed, with dance floor, stage with the latest audio/visual equipment, projection system and the Main Salon Bar. The SeaDream Boutique – The Boutique is open when at sea to allow guests to purchase duty free. It offers fine gifts of international name brands, sports and yacht-wear, and necessary personal items. The SeaDream Boutique is also available online at www.seadream.com featuring logo items and other specially selected items. Water Sports Marina – Each yacht features a large retractable water sports Marina providing a variety of water sports activities including kayaking, a Zodiac® for water skiing, a banana boat, tubing, boarding, wave running, snorkeling, Sunfish® sailing, snorkeling, swimming, a floating island and the assistance of the yacht’s Marina staff .